It is now time to get the main crop off the hives and consider Varroa treatment and how you intend to feed the hives ready for the winter. 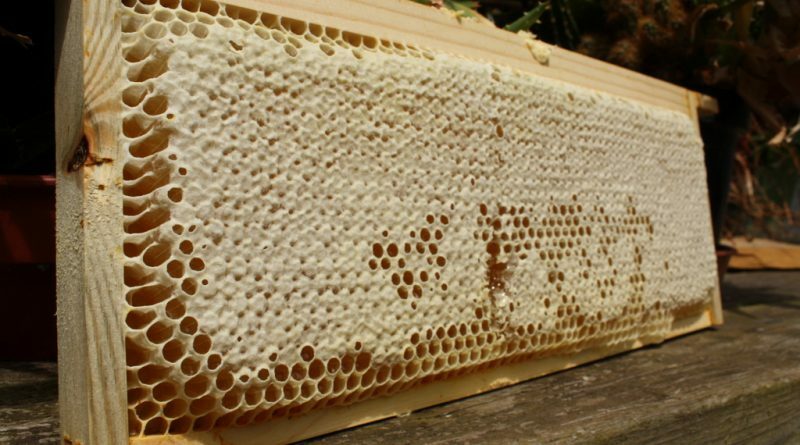 When removing supers (numbered with chalk) full of honey please remember that the bees you have cleared out of them need somewhere to go! It helps if you put a super with empty combs under the clearer board so they have somewhere to cluster and as the nights cool down they should readily do this. Ensure the supers full of honey are ‘bee proof,or the Wasps and Robber bees will clear them for you and create a robbing frenzy in the apiary and steal all your crop. Try to extract the honey soon after you take it off the hives whilst it is still warm as it will fly out of the combs a lot easier and the air bubbles rise quicker in the ripening tank. After extraction return the wet ‘numbered’ supers to the hives they came from to prevent the spread of disease and do it in the evening again to prevent a feeding frenzy. Adding the wet supers in the evenings allows the bees to clean them before the colony starts to forage the following morning. It is best if you have an empty super with no combs or eke to put between the wet supers and the brood chamber as the bees will clear down to the brood chamber in the cooler evenings. Once clean all supers can be removed from the hives (on a cool evening) and stored for the winter in a bee and vermin proof ‘stack’ if you can with a metal queen excluder top and bottom and a decent roof.Beware of the wax moth and look in the newsletter on sterilising of combs with Acetic Acid to prevent destruction by the moth or the spread of diseases. Once you have removed and stored those valuable super combs for next season it is time to consider treating your hives against Varroa. It is best to do this before you feed for the winter and when most Queens will have reduced or stopped breeding so you have little brood for the Varroa mites to breed in. There are many treatments to choose from on the market but whatever you use please read those instructions and beware some are temperature related so need using when it is warm in early August(British weather depending). When using a Thymol based one you will need a eke or empty super above the brood chamber so the fumes can dissipate down and knock the Varroa off the bees onto the floor. It is always a delight to take out my Varroa slides with the horrible little parasites or collect them onto sheets of newspapers and then have a sacrificial burning of the little pests(I try to be polite). We also need to prepare for feeding next month and these days it is a good plan to leave the queen excluder on above the brood combs if you intend to use Bakers Fondant later in the year. Please do not be afraid to feed a little syrup to the colonies that need it as you have taken their main honey crop and the weaker colonies will need a top up ready for the main feed. The worker wasps are already about and bothering the hives so reduce the entrances on you weaker hives and consider getting the wasps traps out and installed near but not next to your hives.The recycling bin in our household has already become half empty as I recover every plastic and glass bottle to use as wasp traps with something in that attracts wasps but not bees. Old beer is good! If you find any nearby wasps nests treat at night when they have stopped flying and use Ant powder as it is a third of the price of Wasp powder and has the same active killer ingredient. The temperament of many hives will soon be on the turn as the bees get ready for the Autumn and Winter so ensure you are well protected when working on the hives to them you are just a very large Wasp out to destroy their colony!